This time, I will ask about Nintendo Land that is going to be released simultaneously with Wii U. First, please introduce yourselves, mentioning what you worked on. 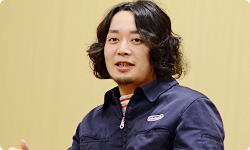 I’m Eguchi from the Software Development Department of the Entertainment Analysis & Development Division (EAD). I was the producer of this game. I’m Shimamura, also from EAD’s Software Development Department. Together with Yamashita-san, I was a director. I also worked on the Team Attraction called Metroid Blast. I’m Yamashita from the Software Development Department in EAD. I was a director. I was also involved with Pikmin Adventure and in-game features relating to Miiverse1.1. Miiverse: A network service, integrated with Wii U at the system level, that allows people all over the world to connect through their Mii characters and more fully enjoy video games. People can interact by sharing their thoughts in the plazas of their favourite games and by posting handwritten illustrations and comments. Shimamura-san and Yamashita-san, you haven’t directed as a duo since Wii Sports2 and Wii Sports Resort3. 2. Wii Sports: A sports game containing five individual games: Tennis, Golf, Bowling, Baseball and Boxing. It was released simultaneously with the Wii console in December 2006.3. Wii Sports Resort: A sports game released for Wii in July 2009. Players can enjoy playing 12 sports – including Wakeboarding, Power Cruising, Swordplay and Archery – on a tropical resort. 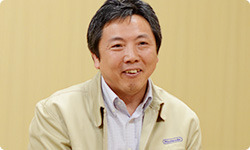 I’m Sakaguchi, from the Software Development Department in EAD. As art director, I worked on the overall visuals and creating the atmosphere. All right, thank you. We actually began developing Nintendo Land at about the same time as Wii U, so parts of its development story overlap. Eguchi-san, what kind of requests did you first make to Shimamura-san and Yamashita-san? As I remember it, completely separate from what kind of gaming console Wii U would be, our own team performed a number of experiments with regard to gameplay using both a small screen in your hands and the television screen. That was back when we haven’t yet decided on a concrete concept for Wii U. We experimented with many things, and one of that was to see what would happen if we added another dedicated screen to a TV game console. I thought that might come up, so I brought this as a prop today. This was the start of two-screen gameplay. Yes. I did that, too. An experiment using the Wii Zapper4 controller was what inspired us to put a gyro sensor5 in the Nintendo 3DS system, which was in the final phases of development.4. 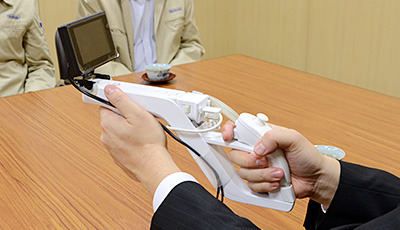 Wii Zapper: An accessory for the Wii Remote that is shaped like a rifle. It is used as a set with the Wii Remote controller and Nunchuk.5. Gyro sensor: A device that detects angle and rotation speed. The term "gyro" refers to a "ring" or "rotation." Yes. After development of Wii Sports Resort, Yamashita-san and I were thinking about something new that would draw upon the knowhow for Wii MotionPlus6. We tested gameplay that involved moving the Wii Zapper and having images from the Wii move in sync on a monitor in your hands. It was fairly well received…6. Wii MotionPlus: An accessory with a gyro sensor for connection to the Wii Remote controller. The Wii Remote Plus controller, which adds the functionality of Wii MotionPlus to the Wii Remote, is now on sale. The Wii Remote packaged with the Wii console has also been replaced by the Wii Remote Plus controller. 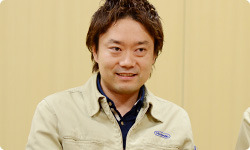 When (Shigeru) Miyamoto-san saw that experiment, he said that he definitely wanted to put a gyro sensor in Nintendo 3DS, so even though the ship was headed out of the harbour, he called it back7. This happened after the people in the hardware department had already declared “All features are now set!” (laughs)7. 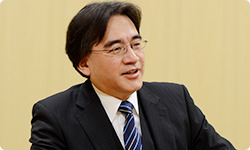 Even though the ship was headed out of the harbour, he called it back: For more about how the gyro sensor was included in the Nintendo 3DS system, see the session of “Iwata Asks” about the Nintendo 3DS hardware concept. Yeah. (laughs) We intended to present it as a Wii U project, so when it was snatched away for Nintendo 3DS, we were sad, but also pleased. 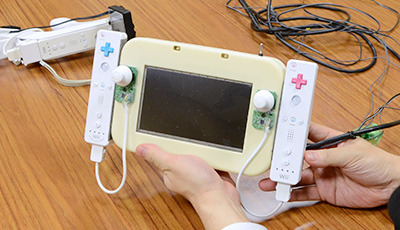 But thanks to this prototype, however, we were able to explain the structure of Wii U – having a screen in your hands – and it became more compelling. The way that Nintendo makes hardware is to take an idea that has arisen and make something makeshift and actually try it out. Right. The next makeshift thing we made for Wii U GamePad concept – a second prototype – is this. I remember that you made a lot of prototype software with this. Yeah. If we made a list, I think there’d be about 30 pieces of software on it. We used this prototype and two Wii consoles to run simulations for Wii U. EAD isn’t a hardware department, but a “handicraft team” that’s knowledgeable about hardware makes stuff like this. Making this prototype led to Nintendo Land, so the development period for Nintendo Land was quite long. 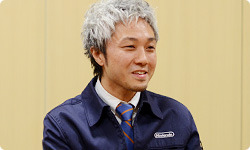 However, rather early on, you discovered the “asymmetric gameplay”8 structure for Nintendo Land that we announced at E39 this year (2012) – in other words, the fun of having one person play a different role in a multiplayer game, was discovered at a fairly early stage in development thanks to this attempt. 9. E3 (Electronic Entertainment Expo): A video game trade show usually held in Los Angeles. That’s right. However, when we thought about what kind of product to make for Wii U, it took a lot of time to decide the direction to take for pulling everything together into a single game. For example when we were developing games for Wii, we made the Wii Sports game with the tennis game as its centre. But this time, even though there were many fun prototype games, it was difficult to package them into one game in the same way we did for Wii Sports. So for Nintendo Land, inventing a new packaging format was necessary in order to pack them all into a single box. Right. When we were puzzling over that, one of the staff members expressed a desire for a game that would gather Nintendo’s franchises into a single spot, so you could play them one after the other. It was quite a grand concept. But we wondered, “How do we bring them all together?” We didn’t take it too seriously. That’s when we started thinking about it with the phrase as, “What if Nintendo made a theme park?” We tried making something like a theme park poster with a bunch of Mii characters lined up under the catchphrase of “Nintendo Land Is Now Open in Your Living Room!” and it came off nicely.